Studio Athletica - Downtown Toronto lower leg physiotherapy - Call Now. Below you will find a list of symptoms and conditions that we see with our Downtown Toronto lower leg physiotherapy clientele. Whether you participate in sports, weightlifting, or lead an active lifestyle, it is not uncommon to sustain injuries or feel some degree of discomfort or pain due to overuse of the muscles, bone, and tendon in this area. At Studio Athletica, we specialize in several different services that can help treat your health problems. Please feel free to read more about your symptoms, conditions and our suggested treatments, or contact us to pinpoint the best treatment to heal your body. The downtown Toronto lower leg physiotherapy program is the gold standard. Our Downtown Toronto lower leg physiotherapy program sees a lot of shin splints. The term “shin splints” refers to pain along the shin bone (tibia) – the large bone in the front of your lower leg. Shin splints are common in people who have recently intensified or changed their training routine. The increased activity can overwork the muscles, tendons, and tissues in the lower legs. Shin splints will cause soreness and pain along the inner side of your shin bone. Mild swelling may also be apparent. You may notice the pain stop when you stop exercising however in some cases the pain can be continuous and may graduate to a stress reaction or fracture. Our Downtown Toronto lower leg physiotherapy program sees a lot of compartment syndrome. Compartment Syndrome happens when excessive pressure builds up inside an enclosed muscle space inside the body. Compartment syndrome usually results from bleeding or swelling after an injury. It’s a serious condition that impedes the blood flow to and from the affected tissues and require surgery to prevent permanent injury. 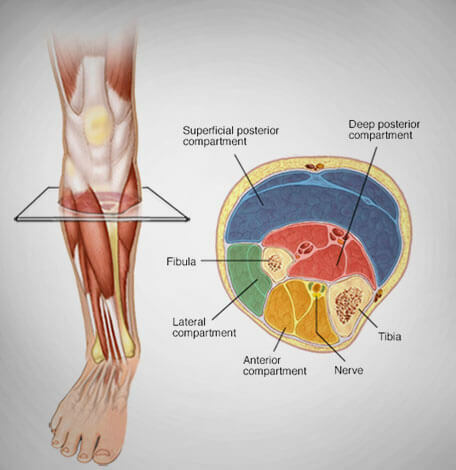 The legs, arms, and abdomen are most prone to developing compartment syndrome. Compartment Syndrome will feel like pins-and-needles or an electricity-like pain in the limb including swelling, bruising, and numbness. Our Downtown Toronto lower leg physiotherapy program sees a lot of calf strains. A muscle strain (pulled muscle) occurs when the muscle fibres endure strenuous activity beyond their limits. This often happens in sports when players sprint, change direction quickly, or stretch to reach, block, or return a pass. Mild muscle strains will usually result in soreness, swelling, and may inhibit the range of movement around the affected muscle. More serious strains will cause considerable pain and severe restriction in movement. A calf strain can happen when the calf muscles are overstretched. This can be caused by a sudden, abrupt movement or as a result overuse when the muscles are not warm up enough before exercise. Our Downtown Toronto lower leg physiotherapy program sees a lot of pes anserine bursitis. Pes anserine bursitis is an inflammation of the bursa located between the shinbone (tibia) and three tendons of the hamstring muscle at the inside of the knee. When the bursa becomes inflamed or irritated, this results in Bursitis. The bursa is a sac filled with fluid which reduces friction and irritation between tissues such as bone, muscle, tendons, and skin. 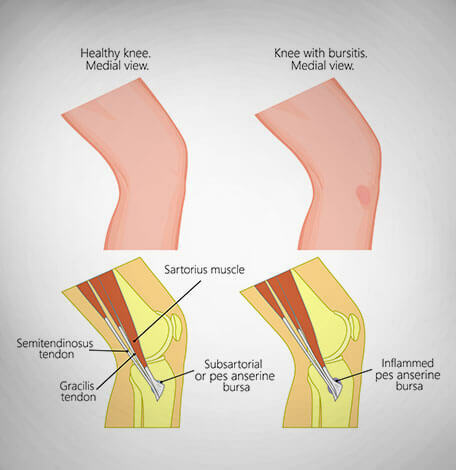 Bursitis occurs when there is added stress to the bursa sac such as a poorly placed bone or abnormal joint. It is more common in adults over the age of 40 years however, people who are active and participate in high impact sports or weightlifting are more susceptible including poor posture at work or home and poor stretching or conditioning before exercise. The most common symptom of bursitis is pain that is either gradual or sudden, both feeling quite severe.